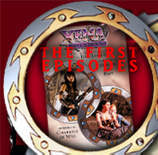 November 10, 1998: Xena Season Two videos collection is now available! Click here for more details! April 5, 1999: New at The Tribe...Xena Wallpapers, free to download for Xena's Warriors, & The Xena Gallery. Now Showing at the Xena Tribe: Trilogy Previews, including the Hercules-Xena love scene! Be sure to use your email address as your name when you log in and set your browser to accept all cookies. Customer Service has a new email address. Keep an eye on the The Warrior Scrolls! Inside the Scrolls you'll find inside information about the show and it's star, Lucy Lawless. The 'fire' clip has been approved! The Video Previews have moved out of the Tribe area. Check them out! Look for on-line chat for Tribe members in the next week or two. Lucy Lawless makes her video singing debut with the original song "What Do I Do Now?" available exclusively with the Animated Movie. This full-length feature stars Lucy Lawless, Kevin Sorbo, Renee O'Conner and Michael Hurst as Iolaus. 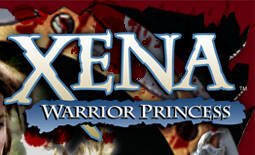 Xena Frequently Asked Questions (FAQ) are now on-line. If you have any questions about this site, check here!